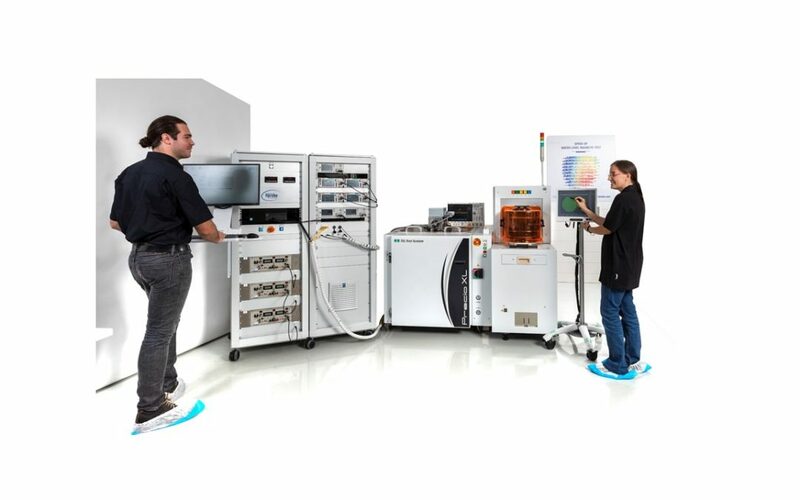 Hprobe, a provider of turnkey semiconductor Automatic Test Equipment (ATE) for magnetic devices, develops advanced testing methods and industry-oriented control protocols for emerging memory technologies such as STT-MRAM and SOT-MRAM. Following the release of an advanced magnetic tester for STT-MRAM, Hprobe is now entering into a new phase of development for the next generation of MRAM devices based on the Spin Orbit Torque (SOT) effect. SOT-MRAM technology has demonstrated stellar performance in terms of writing speed using pulsed voltage with pulse widths down to 200 picoseconds. It has all the advantages of the Spin Transfer Torque (STT) MRAM technology including size scalability for CMOS integration, the absence of data refreshment and does not require the of use storage capacitances. SOT-MRAM technology has all the characteristics to become the technology replacement for SRAM in the coming years. Hprobe’s test equipment allows users to test STT-MRAM at the wafer level under a magnetic field and using electrical pulsing with ultra-competitive testing-time, which makes it the key player to support the current ramp-up of STT-MRAM into high volume production. From this juncture, Hprobe is now collaborating with imec on a Joint Development Program to extend its fast testing protocols for the SOT-MRAM technology. “We have seen a lot of commercial traction in wafer level magnetic ATE for emerging memories as STT-MRAM technology is now entering into mass production. imec will help us develop the test regimes and protocols to enable Hprobe to release new test equipment able control STT and SOT-MRAM devices with outstanding throughput and sorting performance”, says Laurent Lebrun, CEO of Hprobe. Initially, Hprobe will deliver their leading-edge tools to imec for performing wafer tests under a magnetic field. Jointly, imec and Hprobe will contribute to the definition and validation of the new testing protocols for both STT and SOT technologies by using technology developed at Imec. “The collaboration with Hprobe is a great opportunity to hasten the development of SOT-MRAM; it will help us to bring the technology closer to the industrial level”, said Kevin Garello, SOT-MRAM Lead Engineer at imec. Hprobe has begun to optimize the test flow for SOT-MRAM devices in order to bring the characterization and testing to an industrial level as they have already done for STT MRAM technology. The primary objective is to reduce the testing time while maximizing yield. Founded in March 2017 and located in Grenoble area (France), Hprobe is a spin-off company of CNRS/CEA/UGA Spintec laboratory. The company markets equipment for wafer level testing of magnetic devices in the semiconductor industry. Hprobe technology is based on patented magnetic generator with unparalleled field sweeping performance allowing their family of testers to achieve the world’s fastest testing time performance.